The further adventures of Osmosis Jones and Drix as they defend the body of a young boy. The Story of three masked wrestlers in Wrestling school. A group of friends find a portal to Perim, another worldly dimension, where Chaotic, a popular card game, is real. A boy who just moved to Bubbletown repairs a transformable robot named Cubix and becomes its owner. Together, along with the boys friends, they fight against the schemes of a mad doctor. The series exploits the failed tries of an unlucky bad guy, Hector Con Carne, to domain the world, along with a stupid bear, an otimistic and annoying mad scientist and a grouchy army official. A foreign exchange student interacts with the inhabitants of a deserted island. The adventures of a highly intelligent, talented and rather generous weasel and a stupid baboon who has no talent at most things. Drix: You have a secret adrenaline supply? The Mole: Who told you this? They will suffer! The Mole: Oh, yes, well maybe I could let myself off with a warning...but NO! I must be punished! No one crosses The Mole, not even, The Mole! The Mole: Let that be a lesson to me! I used to love watching mind-numbing cartoons when I was a kid. Now, at the ripe old age of 25 I thought I had grown up a bit...apparently not. Studying medicine is draining and I needed something in the evening to relax to, so I decided to re-watch a number of cartoons from my youth. I found all the episodes for Ozzy and Drix and was so full of nostalgia that I could not resist myself. Ozzy and Drix takes place in the city of Hector, a teenage human being who literally sets the stage for this show. Ozzy (aka Osmosis Jones) is a white blood cell with an attitude like Will Smith in Bad Boys, whilst Drix (aka Drixenol) is a multi-faceted pill who is also somewhat nerdy. This pair are part of a policing unit in the city of Hector, who are committed to fight invading pathogens. Both have their individual charm and comedic value, which makes their pairing a great one. Despite wanting to watch this show for its ability to let me go on autopilot at the end of a long day, quite the opposite occurred. The episodes themselves are are incredibly clever as they use medical language (in a very basic sense) to form the basis of each storyline. For example, representing the spleen as a literal vacuum destroyer of pathogens was a stroke of genius to enable children to understand its function. Other clever aspects would have flew over my head as a kid, but they do make me chuckle now that I am studying medicine. Having a dog allergen being called 'dander' being one such case. In a world full of cartoons that rely on stupidity to be 'funny', Ozzy and Drix do not and I really respect that. Aside from comedy, some episodes have a truly strong message. "Where's the smoke" is a prime example of this, whereby the basic concept of smoking and its consequences is explained brilliantly. It is these qualities that sets this show apart from most cartoons. However, by the same token, it may have been its downfall. It was too clever for its own good and kids quite simply did not get it. 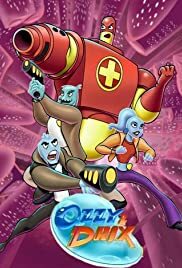 In a sea of cartoons where comedy that relies on stupidity, current trends and violence reign supreme, Ozzy and Drix could not complete. All in all, Ozzy and Drix was a great show (let alone a cartoon). It's a shame it did not continue , because I truly believe this cartoon would have entertained children as well as benefited their minds.